Personally I don't advocate walking around looking like an extra in Howard's End or a Jane Austen mini-series for Channel 42 and personally I would prefer if the gentlemen had read Cycle Chic's guide - Gentlemen Prefer Bicycles - in order to choose an suitable velocipede for his daily journey, but damn it's a fine little video. It's from the now defunct Fashion vs. Sport Exhibition at the Victora & Albert Museum. Thanks to Matthew for the link and he's wondering what the music is. I'm guessing Vivaldi. Any guesses? But hey, while we're in knickerbocker mode, it's a great opportunity to post this brilliant guest photo from Jacob here in Copenhagen of a Copenhagener on the Metro. And thanks to another reader in Portugal who sent us a Cycle Chic advert from the cosmetic company Clarins that is all over the streets of Lisbon. No idea who the composer is, but I'm pretty sure it is likely a "house composer". The music is definitely modern and has nods not only to Vivaldi's "For Seasons" in the beginning, but also to Wagner's "Ride of the Valkyries" and at the same time the storm sequence from Beethoven's Pastoral Symphony (#6). it would probably be in the show's credits. Cool video, but I think it needs a water balloon at the end. Speaking of video, a Malaysian band's music video features a cruiser in the beginning and the end. Good music fills in between. 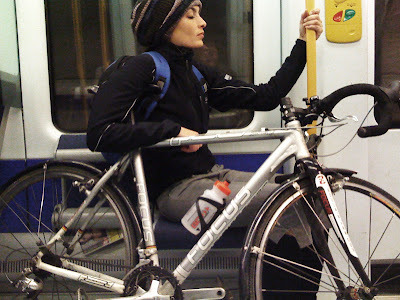 that woman on the metro needs to cut her steering tube down to size! In Portugal, those outdoors have a magazine version. It says something like "The best way to slim down? A bit of will. A bit more of bicycle. And Lift Minceur yadayada".